One of the tools I used when I was designing broadcast and aviation audio gear was an Audio Precision System One. This audio analyzer and its successors are used by audio engineers, manufacturers, reviewers to run new equipment through its paces. 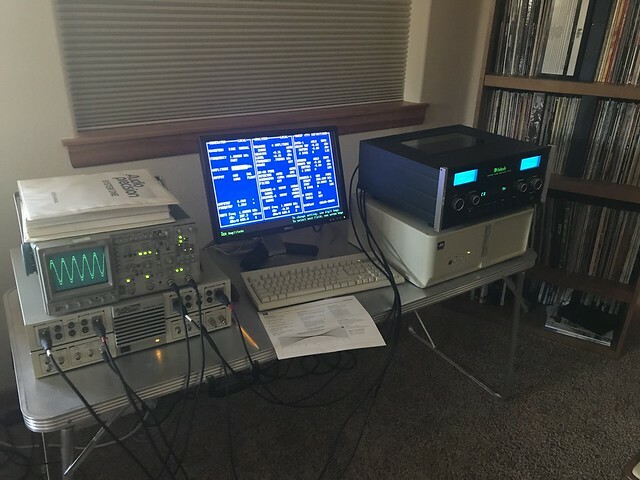 I recently acquired an Audio Precision System One + DSP and have been re-acquainting myself with it. It was like catching up with an old friend. This system runs on DOS, and I don't have an easy way to get data out of the PC that runs it, or even screen captures for that matter, so i am taking pictures of the screen. Apologies for the poor quality. I know there is a bit of controversy over the audibility of measurements – what’s important, what’s not. The ear is an incredible instrument. We certainly can hear things we can’t measure. Or maybe we aren’t measuring the correct things. One of my goals is to try and correlate what I am hearing with what can be measured with modern DSP techniques. My first project was to run a friend’s C 2300 through its paces. I also own a C 2300 (my 2nd) so I was curious to see how it performs technically. I already know it sounds great. Overall setup and test conditions. I do not know the age of the preamp or the tubes that are in it. The line stage had Amperex Bugle Boy ECC83s fitted. McIntosh tubes were fitted in the MC and MM sections. I used the C2300 balanced inputs and outputs. The gain of this C2300 is unity when the front panel level control is at 71. That is the level setting where I made all the subsequent measurements. Here is a picture of the test setup. 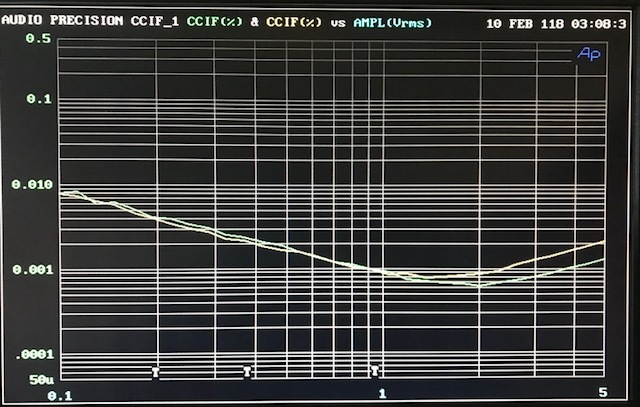 The first test was frequency response of the line section. I measured an extend range, from 10 Hz to 200 kHz. I also used a +/- 5 dB vertical scale to really see the response curve. I like to see how gear performs at the limits. 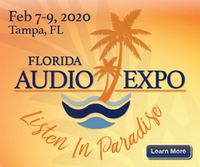 The McIntosh specification is +0, -0.5 dB 20 Hz to 20 kHz. This C 2300 easily met those specs. It falls off rapidly above the audio band. I also noted excellent tracking of L and R channels. Next up is THD+N. I measured this at two levels, 0 dBu, or 0.775 Vms, a level where most people will run their preamp, around -15 dB on the C 2300 front panel meters. 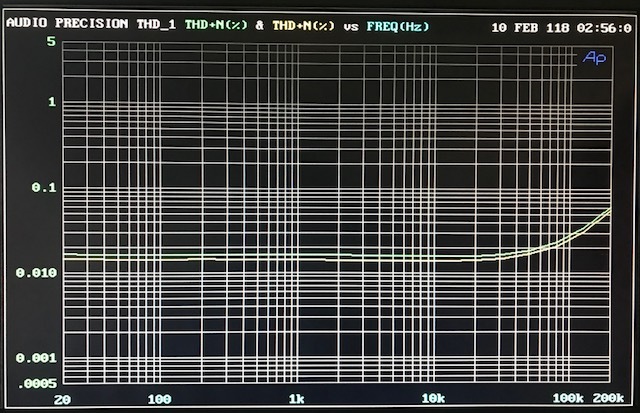 The THD+N was below 0.02% from 20 Hz to 20 kHz, and only started rising slightly above 20 kHz, rising to 0.06% at 200 kHz. This is exemplary performance for a tube preamplifier. Looking at the residual distortion on the oscilloscope revealed mostly noise. Next I ran the C 2300 to it’s manufacturer’s rated output 5 Vrms balanced. 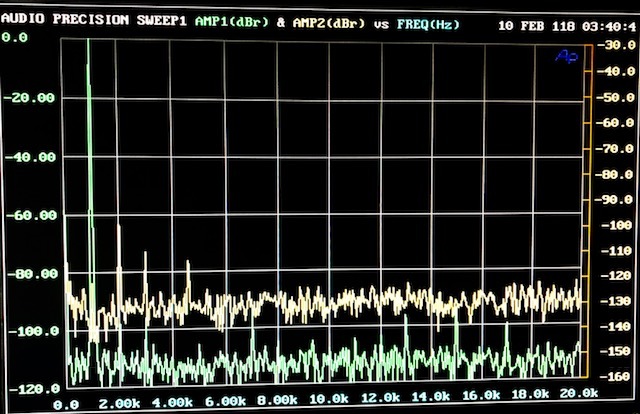 The meters read 0 dB on the C2300. This is a level you would rarely see in practice. 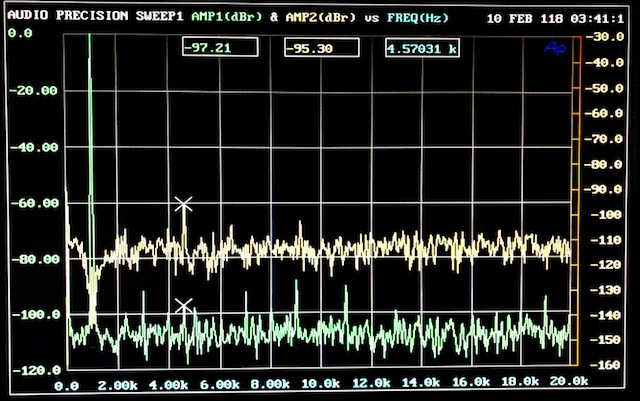 Again, exemplary performance – 0.006% from 20 Hz to 20 kHz. What’s interesting here is that the THD+N dropped with increasing level. 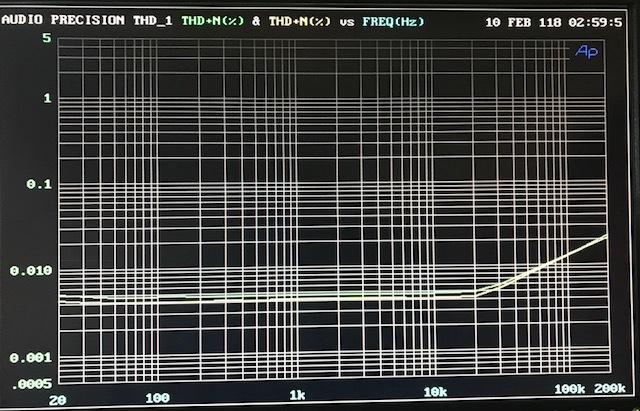 This is due to the fact that most of what we are measuring is noise, so as you increase the input level the THD+N drops as the noise is fixed and does not vary with input level. It has been correctly noted by many that absolute levels of THD+N are irrelevant and do not correlate with what listeners perceive. I believe this is true. What’s important is the level of each of the harmonics. Out of phase 2nd order distortion is euphonic, while even low levels of higher order distortion 5th, 6th, 7th, etc. are perceived as adding grain and harshness. 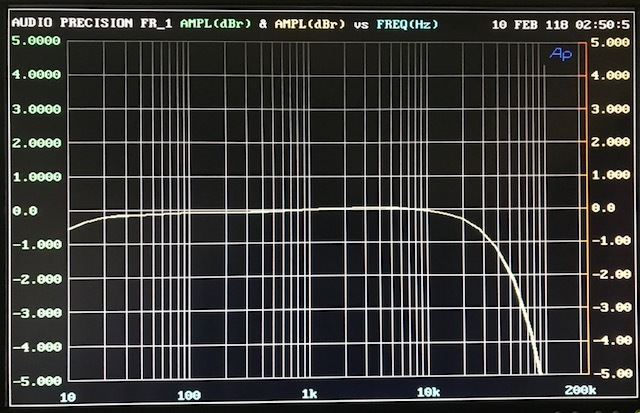 So I ran an FFT of the distortion coming out of the C 2300 with a 1 kHz tone at two levels – 0 dBu, or 0.775 Vrms, a normal level, and 5 Vrms, 0dB on the C 2300 meters. What we are interested in here is the top Yellow trace and the Y axis legend on the right side. Here the 1 kHz tone has been notched out and all that remains is the distortion and noise. There are no harmonics visible at all. This is exemplary performance! But wait, what is that spike at 4.57 kHz? More on that later. But it is not THD! Here you can finally see some distortion coming out of the noise. There is no evidence of higher order harmonics visible. And there is our spike at 4.57 kHz. I found this is independent of front panel volume, and I isolated the C 2300 by moving it 3 ft away from everything. Turns out this 4.57 kHz signal is coming from the meter illumination drive circuit. If you turn of the front panel meters, the 4.57 kHz signal disappears! Now onto the noise itself. I measured the noise over a 22 Hz to 22 kHz bandwidth, RMS detector, referenced to McIntosh’s output specification of 5 Vrms. This was O dB on the C 2300 meters. Again, these are exemplary numbers for a tube line stage. There were no indications of any power supply related spuriae in the output. It was clean as a whistle. In reality, you will probably be running this preamp with an output of – 20 dB on the meters, so you will subtract that number from the above measurements to get a more realistic SNR view. The C2300, while not an internally balanced design, has balanced inputs and outputs. 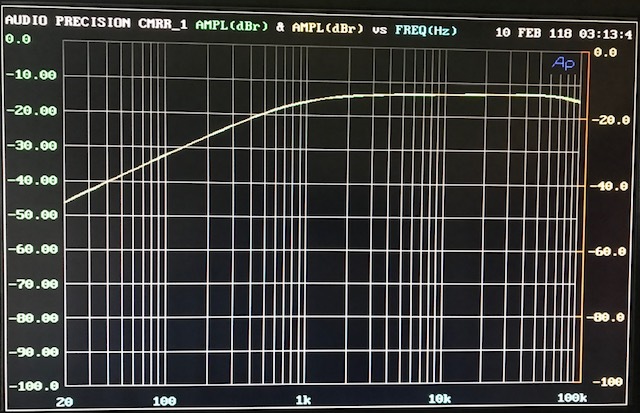 I measured the C 2300 input’s common mode rejection ratio – the ability of the preamp to reject hum and noise. The result is ok at low frequencies, 60 and 120 Hz, where it is about 30 dB, but degrades to only -14 dB at higher frequencies, limiting the preamp’s ability to reject noise on its balanced inputs. In summary, the C2300 is an exemplary tube line stage, with good SNR and low distortion. I’ll exercise the MC and MM phono stages at a later date. Tom.......It is so interesting to see the graphs that represent what my ears have been telling me for years. 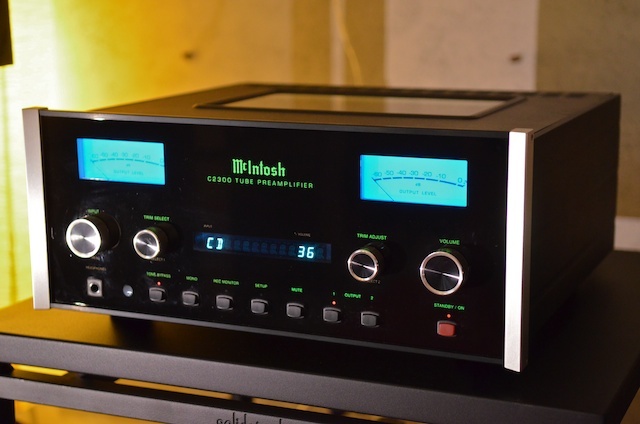 The McIntosh C2300 tube preamplifier is fabulous. I appreciate your effort and expertise in providing this information to us. I love my C2300. It is already a true classic. It is unlikely that I will ever part with mine. Like you I'm on my second one, after regretting selling the first. I won't make mistake again!